Technology is rapidly changing and advancements are made almost every day. Yes, you would have heard this very often, but you'll still have to hear it because it is the truth. You might have read articles and write-ups about how Artificial Intelligence (AI) and the Internet of Things (IoT) are changing mobile applications and the e-commerce industry. So, now let's come to the main question. Have you heard about Progressive Web Apps (PWAs)? Some of you might have heard about it. And some of you might not have heard about it. Well, if you haven't, we'll talk about it now along with the benefits it can contribute to your business. 68% increase of mobile traffic. 133.67% increase in page views. 42.86% lower bounce rate when compared to that of mobile websites. All the above data definitely point out to the fact that there are some great benefits that businesses could harness from PWAs. 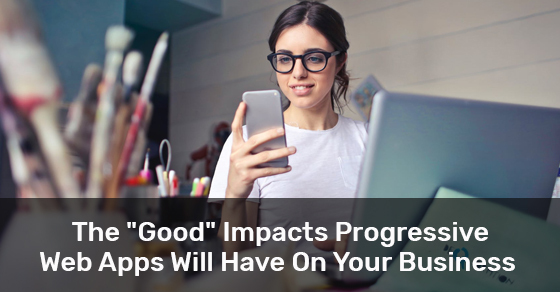 Let's take a look at the key benefits or impacts PWAs will have on businesses. How Can Businesses Benefit From PWAs? When you are running a business, the "cost" factor is one that you will always be concerned about. And, ways to cut it here and there will surely cheer you up. Well, PWAs can help you do that. Since PWAs is a single progressive application - much like the hybrid app, in the fact that it does not need different versions for various devices. You need to develop it only once and it meets all the requirements of all the devices on which it operates. Hence, PWAs will help save you a lot of money which otherwise, you would be spending on developing multiple versions of the same application for each device. Today, there are users who, very often prefer applications than the websites that open in their mobile browser. The major reason is that mobile apps are much simpler, easy to access and there are those that work offline too. So, it is easy for them to access these apps than a website using their mobile browser. PWAs assure to provide the best of user experience by combining and delivering an app that has incorporated within it the best of website performance. If it is a website, then the website owner has to check for updates and then update them. Now, if it was an application, then again, when an update is available, there will be reminders and permission requests for the users. But, PWAs have this functionality in them that helps them to update automatically. These applications automatically update themselves every time while the users visit them. Websites that open up on your browser require internet. But PWAs do not require the internet every time. They can seamlessly operate offline. This perhaps might be one of the best things users would like about PWAs. If you were to visit a web page while you were offline, you would get a blank page. But in case of PWAs, you will get some custom offline pages set based on the information from the pages that the user previously visited. Thus, the user does not feel like abandoning the visit mid-way. PWAs save the text, images and other contents in an efficient manner. This enables them to improve their running speed while also helping them to run like a website. After going through all of the above points, it is true that PWAs can significantly improve businesses since all their functionalities help user retention which, when it comes to doing business is a good thing. PWAs can play a great role in shaping online business. We'll have to just wait and watch how it would.